Tore Wig, myself, and Pat Regan just published an article in Research & Politics that presents an updated version of the Institutions and Elections Project (IAEP) dataset, originally developed by Pat and David Clark. The dataset comprises information on 107 de jure institutional provisions, and 16 variables related to electoral procedures and electoral events, for 170 countries in the period 1960–2012. The article is freely available, as well as the dataset, codebook, and other material. 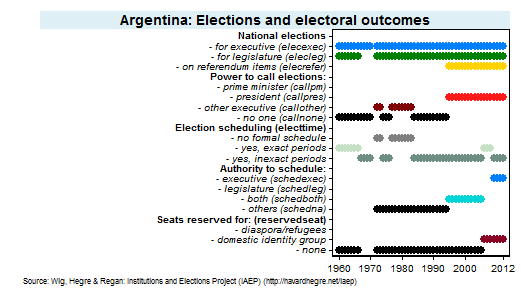 This figure illustrates the constitutional provisions for elections in Argentina. We have also posted such illustrations for all countries and all 123 variables. ← Poor research or what?